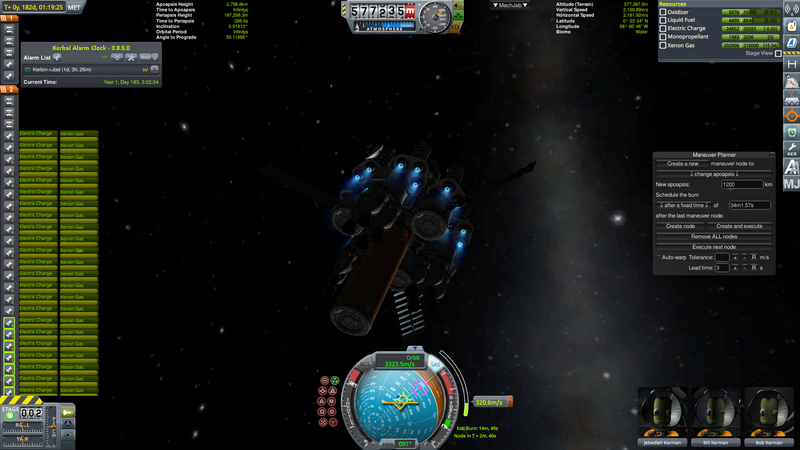 General (3 stars) Jeremiah Icarus Ichabod Kerman, the Kerbal Space Center Base Kommander, was in a foul mood. His two assistants, General (1 star) Halski Kerman and Brigadier General Ronard Kerman, stood across from the desk, eyes downcast and looking very glum. They knew that the General thought of himself as "popular" amongst his command. The word they might have used themselves would have been "autocratic". Or "apoplectic". "General", as General Kerman was universally known on base [or "Harry" while getting drunk off base], had just finished the best part of an hour raging and gesticulating in front of his aids. But he wasn't cross with them; he had just been venting his heart-felt frustration. A command transcript transmitted from Kerbal Space High Command lay on his desk. It was tersely-worded. The two phrases that had gotten under General Kerman's saddle so badly were "get over your mid-life crisis DOUBLE-QUICK, soldier!" and "stop F.A.R.T.ing around in the Hangar, tinkering with new planes, and GET BACK OUT THERE in the universe and EXPLORE!!..." 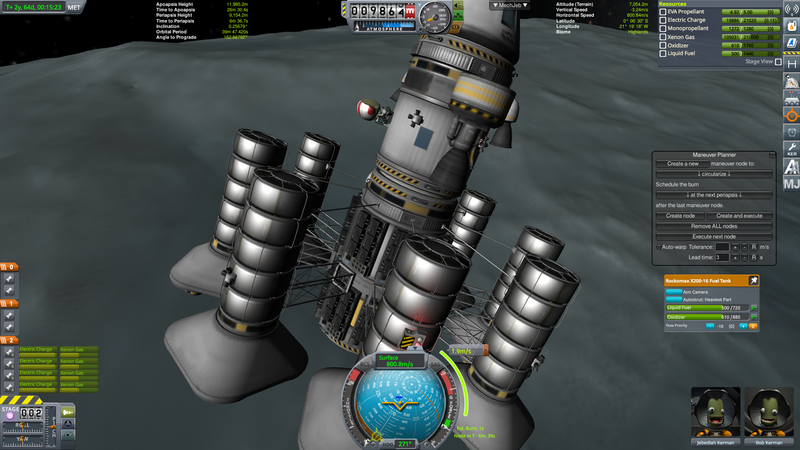 The command had ended with an ultimatum to set Kerbal boots on Vall by the end of the weekend -- or face the consequences. The general snarled, "Get me some boffins in here! PRONTO!! We've got work to do. And only 18 hours to do it in... Let's cut some corners, gentlemen." 1. with the sole exception of his wife and formerly childhood sweetheart, Griselda Kerman, who calls him Icha-BODD! !, when he is in trouble, and Icky the rest of the time. 2. one bridge too far? 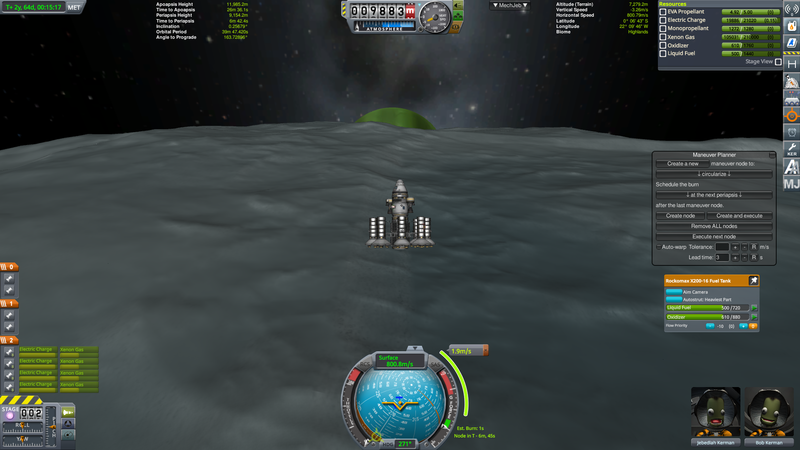 Take 1: Accelerated Mission to Land on Vall -- Gen. Icarus Kerman in command, KSC Mission Control. 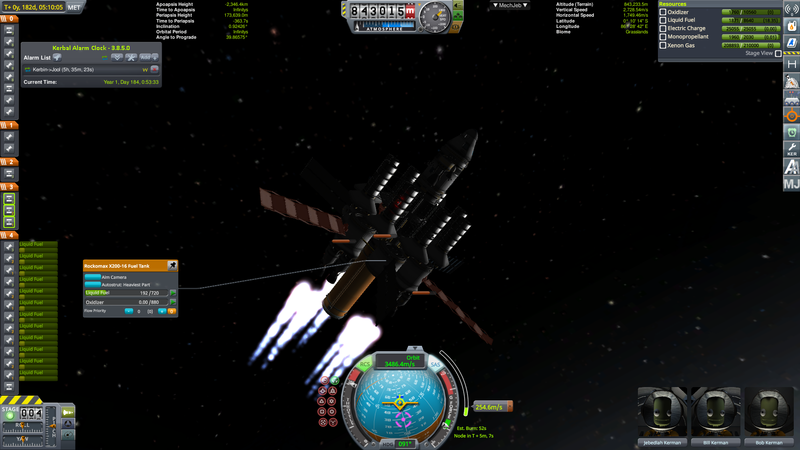 Fully-fueled, Aquila NERV engines are used to make an initial burn to raise apoapsis to 600,000km. The transfer burn continues [screenshots 4, 5] until complete. 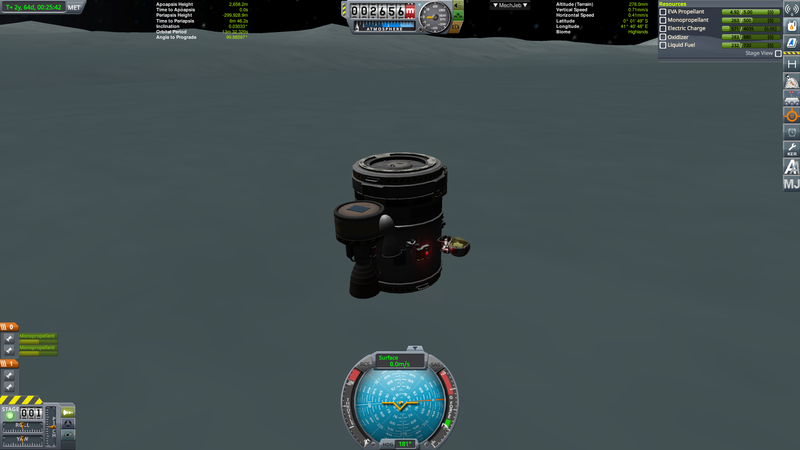 At this time, tracking station shows [screenshot 6] that either a) an error in resuming the original periaptic burn after the first orbit restarted the dV count to the original value, or b) expecting a total dV of approx. 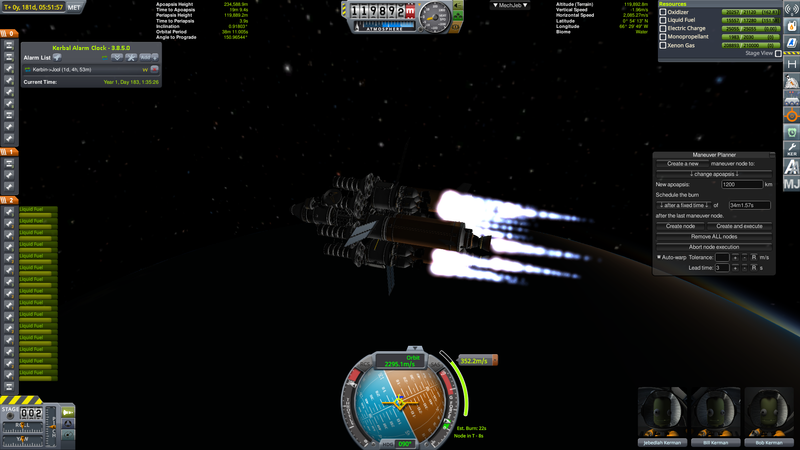 1043 m/s [error using Orbicalc] and subtracting the original burn of 443 m/s completed on the first pass, leaving 600 m/s remaining, failed to compensate for the Oberth effect on the second pass. 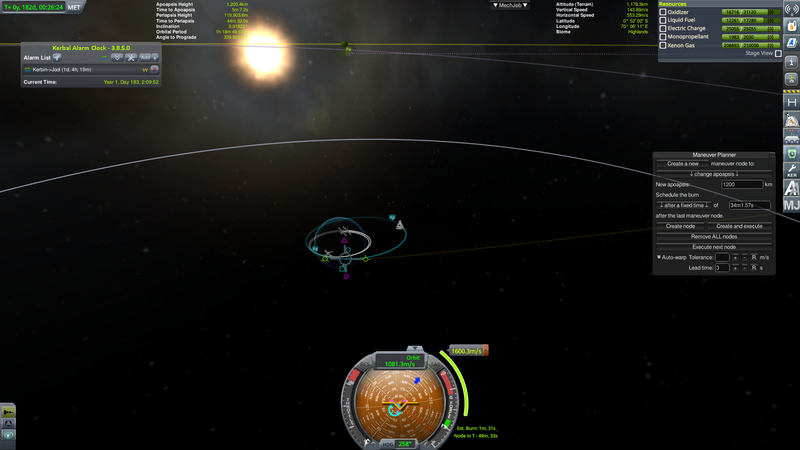 However, sharp eyes will see that that very low dV the target was probably set erroneously for Duna! The mission will enter the Jolian SOI but at very high relative speed and is deemed irredeemable. 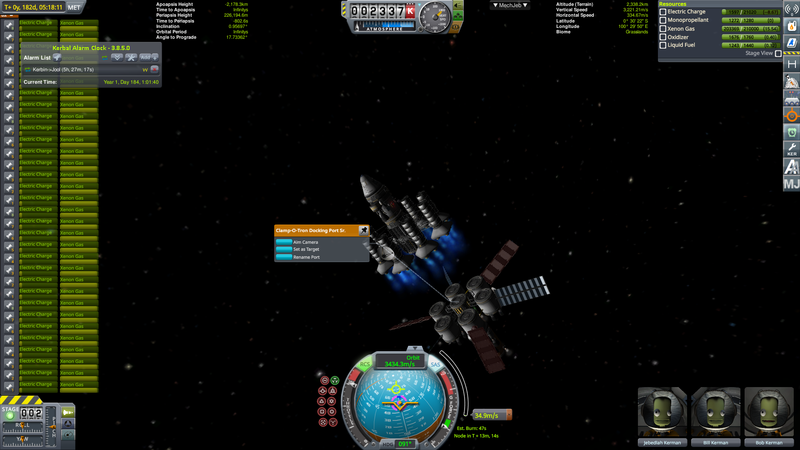 Rookie error and a black day for KSC Mission Control. 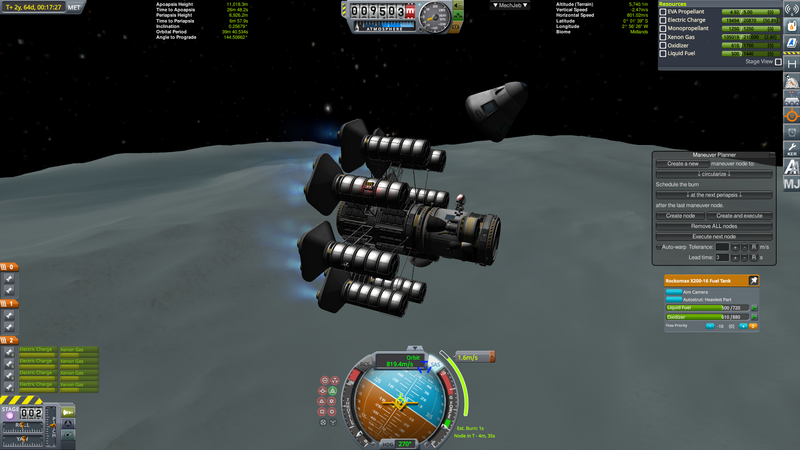 I wonder if Pol or Laythe assist (or even a plural/multiple assist) could be used to get a slight aerobrake from Jool, combined with a capture burn as low as possible to get your Jool capture? 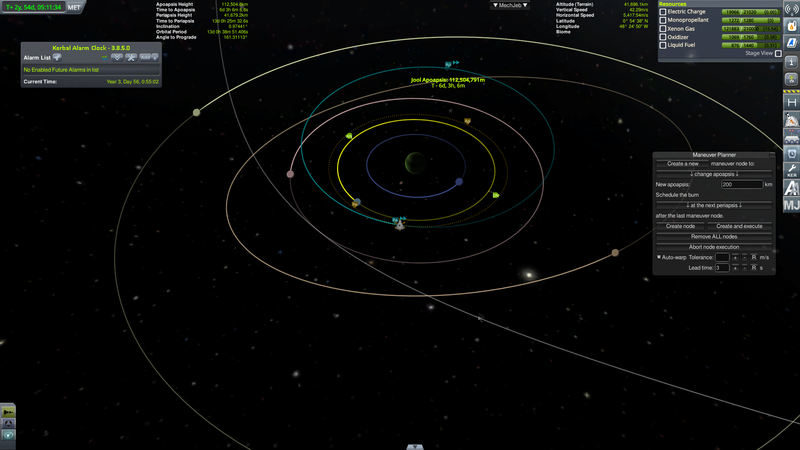 There are lots of gravity assists available around Jool, after all. Quite so! And thank you for the suggestion! 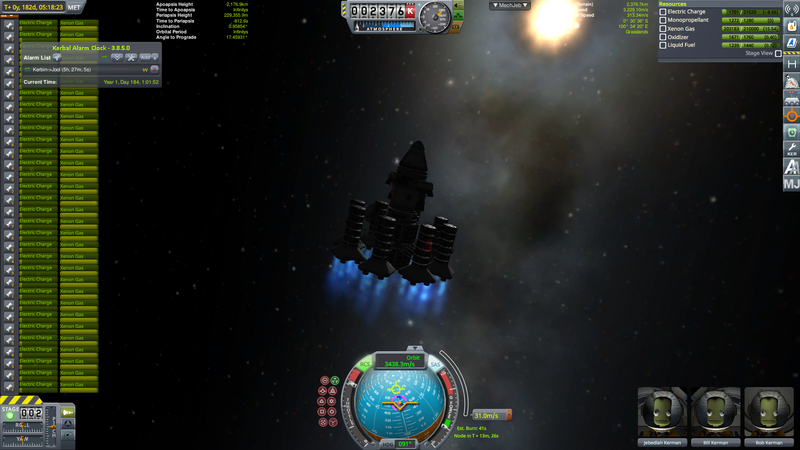 Until recently, I had thought that aerobraking around Jool was the way to proceed. 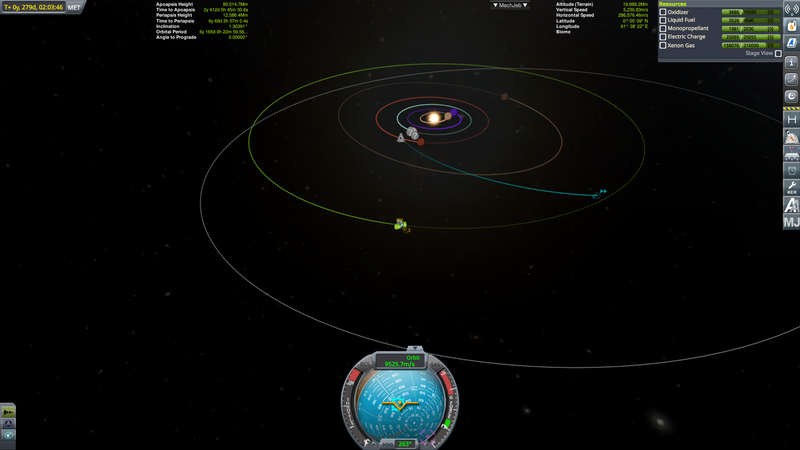 I used that technique back in v1.0.5 and think I found that 170km altitude got my apoapsis down to the altitude of Vall and I happily entered orbit around Vall that time, which is the best I had done to date with the Jolian system. 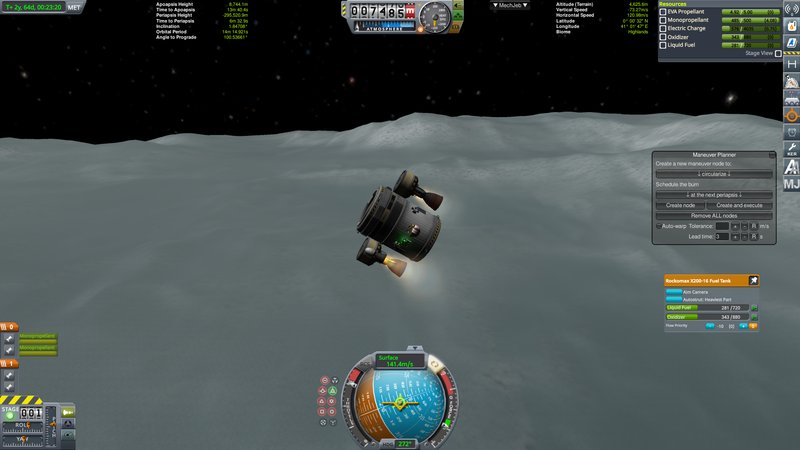 Recently, a colleague whom I will refer to only by his code-name, Master Brain, informed me that aero-braking at Jool is "too dangerous". He recommended a gravity assist at Tylo (which is much more massive than Pol, I think) is the way to go. With no atmosphere, you can dip by it quite closely for maximum effect and then possibly aero-brake at Laythe, if that is the final target. 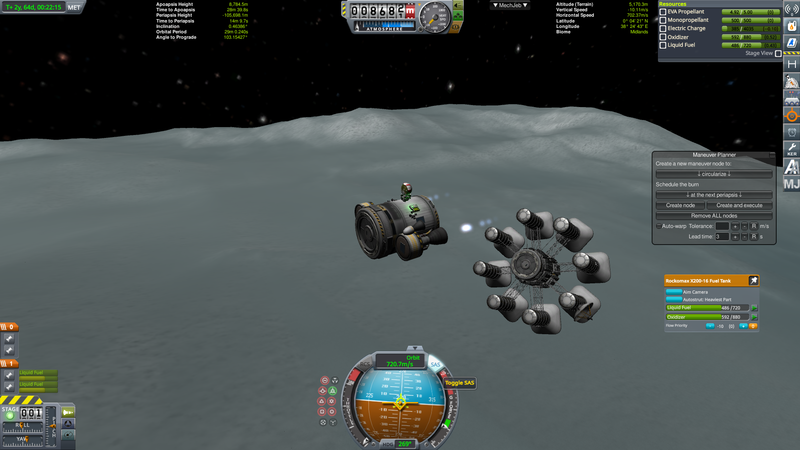 I'd be happy to get just the gravity assist at Tylo! 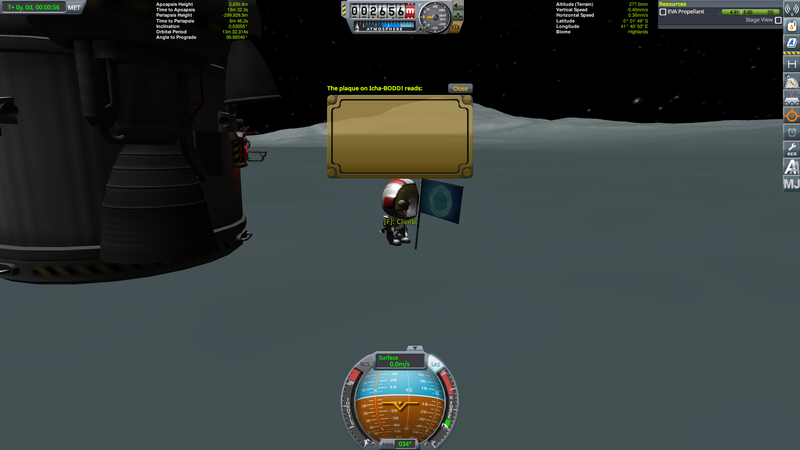 I will update this thread in the next couple of hours with the next episode, Take 2: Accelerated Mission to Land on Vall (which also took place on Sunday). 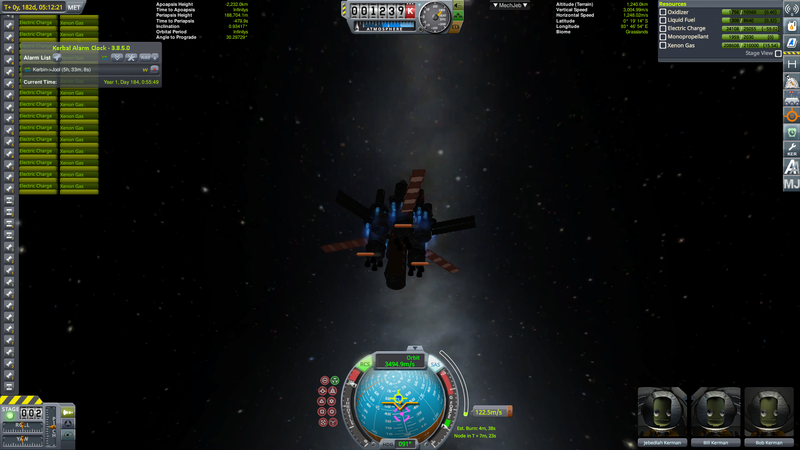 Take 2: Accelerated Mission to Land on Vall -- Gen. Icarus Kerman in command, KSC Mission Control. 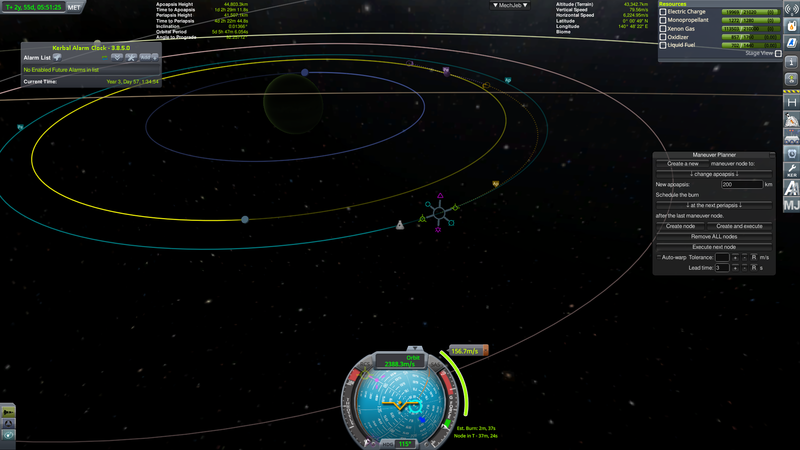 a) Initial transfer burn takes place in a 120 x 70 km orbit. Aquila Mainsail engines have been retained and are in use. Werner von Kerman looks on with a grave visage, silently shaking his head in disbelief. d) 3x spent Jumbos jettisoned along with their Mainsails. 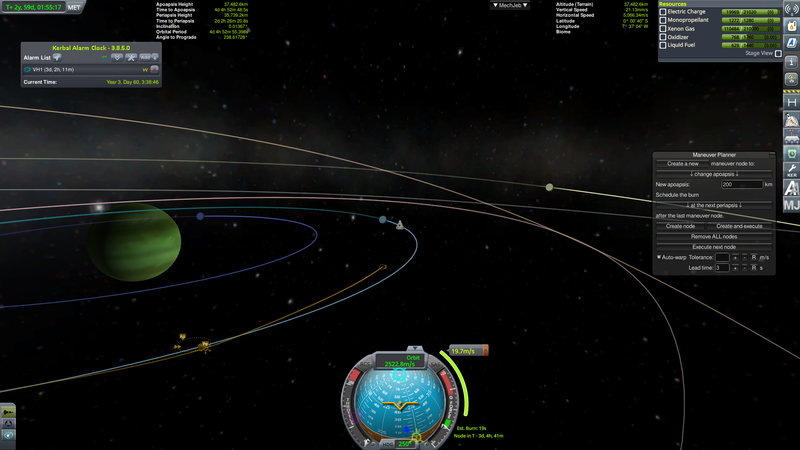 at the finish of the burn, the trajectory looks proper for Jool. e) but after the mid-course inclination adjustment, not so good. The transfer burn and inclination adjustment should have been planned together. Werner is now chuckling. 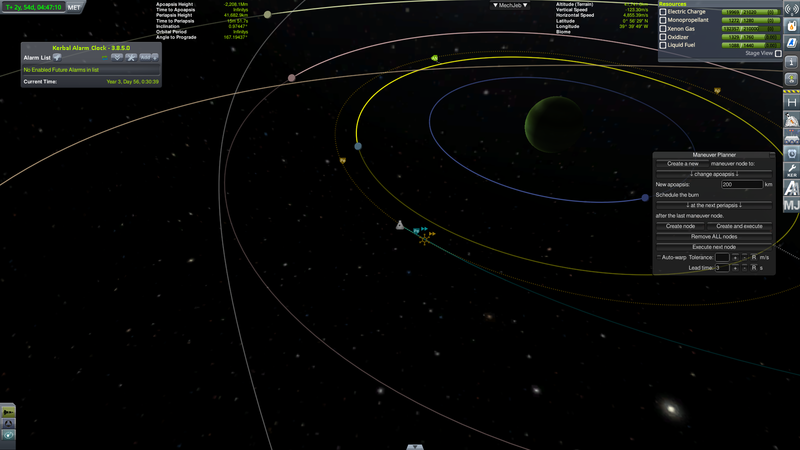 f) Tylo is on the other side of the system, so we conclude [stupidly] that it is out of reach. 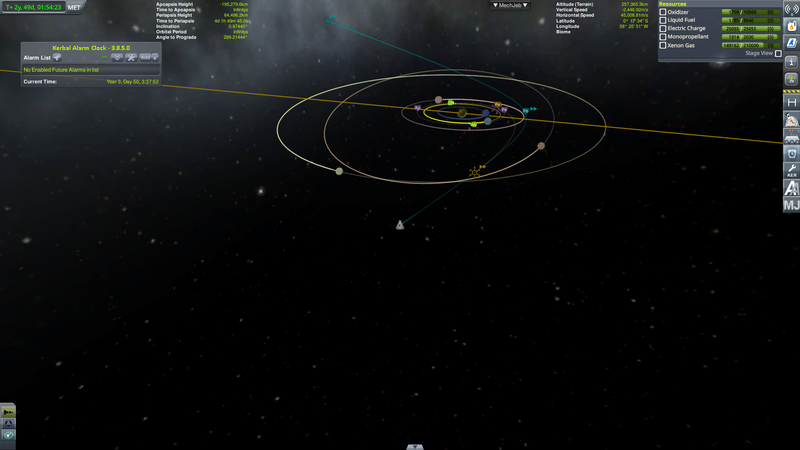 Mission Control searches for contact with Vall. 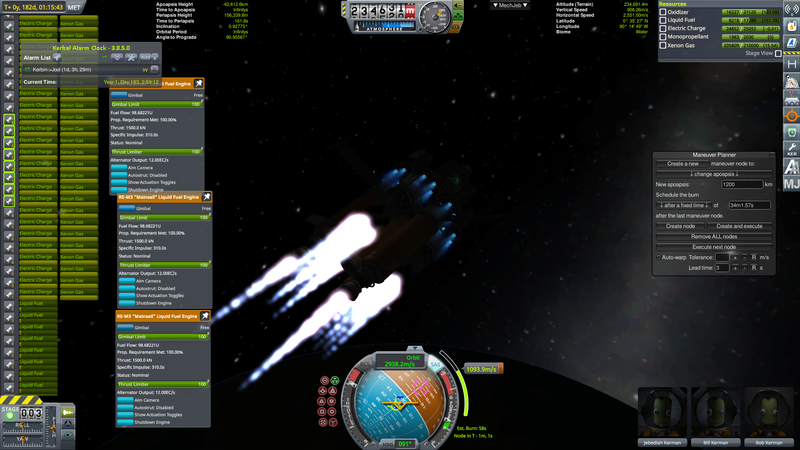 a) approaching the maneuver for Jool capture. 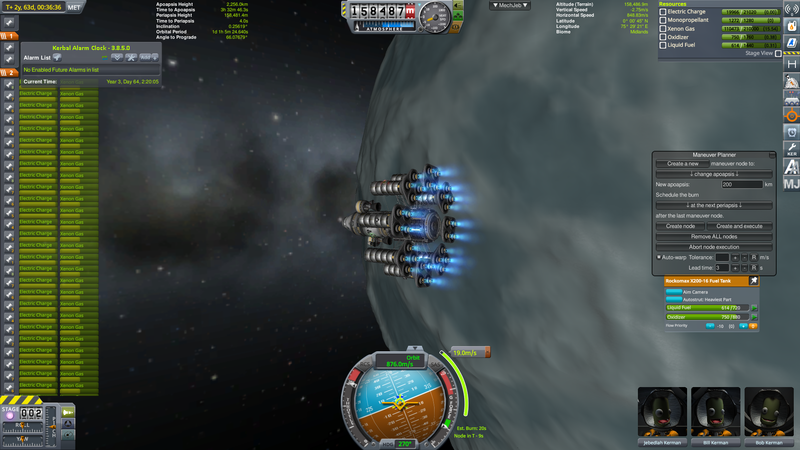 b) Jool orbit secured. 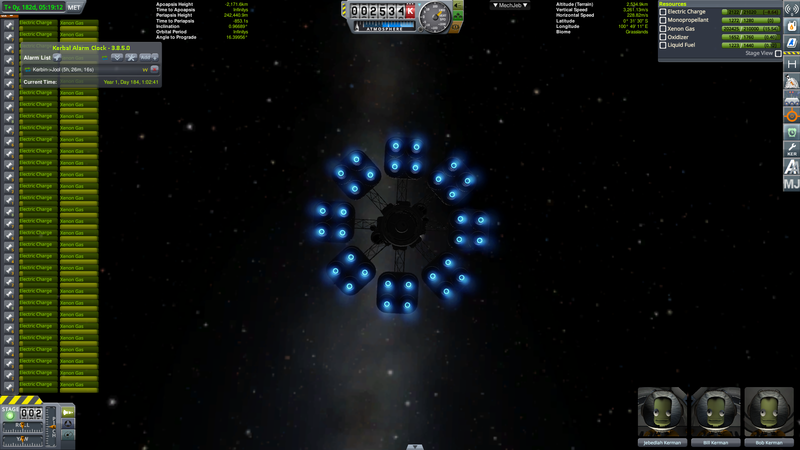 Only the mighty energy reserves of Ion Power could have pulled this off, I think. c) looking for Vall capture. Had wanted the outside but settled for the inside. d) a paltry 19.7 m/s. Almost a ballistic capture. 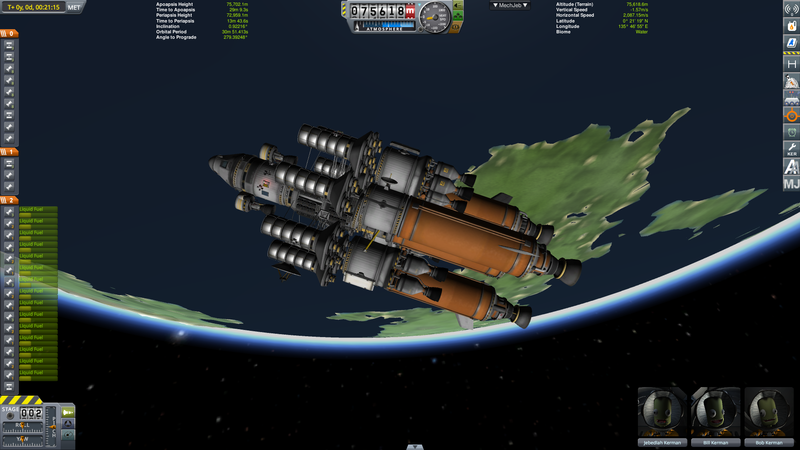 a) Bill Kerman has strapped into the "rodeo seat". His knuckles are feeling frozen. LF=500, OX=610. Werner in Mission Control is muttering, "I haf told you to take panelz! Zose electric gizmoz haf bin sucking your fuel all zis vile!... Now you haff NONE!" 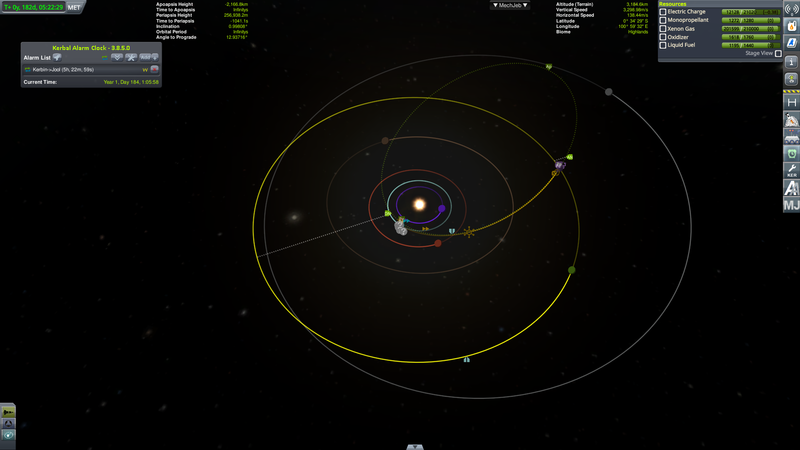 "General Kerman, never forget: you received your fourth star, courtesy the heroic effort of Colonel B. Kerman"
And so General Jeremiah I. I. Kerman was promoted to four-star general in the Kerbal Space Kommand. His job was safe. His mid-life crisis was over. And he was free to return to the Space Plane Hangar and wear his favorite overalls! "ICHA-BOOODDDDDDD!!! Have you forgotten it's our ANNIVERSARY!!! Why aren't you HOME yet??!!!"